Back when I was a young child, I was a big car enthusiast – and I am again today. However, for a period stretching from about the time I was eight years old and fourteen years old, my enthusiasm dropped off for a while as I became more interested in computer operation and gaming. My enthusiasm didn’t die completely, though, with one of the reasons for that being my opportunities to play Gran Turismo on an uncle’s PlayStation. A world of realistic driving physics, contextual representations of all of those statistics such as horsepower and large collections of different car models was opened to me. When I got my own PlayStation later on, Gran Turismo was one of the used games I bought for it. I have returned several times to the game, including a recent re-exploration of the game as I tested out a PlayStation emulator on my PC. Gran Turismo was developed by a division of Sony Computer Entertainment, later renamed Polyphony Digital and released in 1998 after a long and protracted development process that stretched from the original Sony plans for a business deal with Nintendo through to Sony’s own immensely popular first attempt at the console market. At the time, racing games were frequently arcade-oriented, with the racing simulator market being limited to Windows PCs. Gran Turismo changed that, with one of the most accurate simulations of car physics available in 1997 along with an expansive set of customisation options and a collection of available cars that was particularly expansive for the time. The game consists of two modes. The Quick Arcade mode allows for quick, short races against either computer opponents or another human player through two-player split-screen. The Gran Turismo mode is rather more expansive and gives the player the role of a budding racing driver. Starting with 10,000 credits, the player is expected to purchase a used car. From there, by winning races, completing licence tests which in turn open up more advanced races with more competitive opposition and purchasing new cars and new customised parts for existing cars, the game gives a simulation of a racing driver’s career. The car line-up consists of cars from six Japanese, two American and two British car manufacturers. This was an impressive number in 1997, but even then showed a lack of scope; there are notably no Italian or German marques and even in the countries that are represented, there are conspicuously absent manufacturers such as Jaguar, Ford, Lotus and so on. The game claims 178 cars, but many of these are different models of various Japanese cars that are present, most notably the Nissan Skyline and the Subaru Impreza. This would not be the last time that Polyphony Digital over-represented certain car models, but most of the other games in the series had a greater range of car manufacturers to make up for it. Regardless, it’s not bad for a first attempt, especially given that the enormous success of the Gran Turismo series was likely not expected and licences for reproducing cars would be correspondingly more difficult. 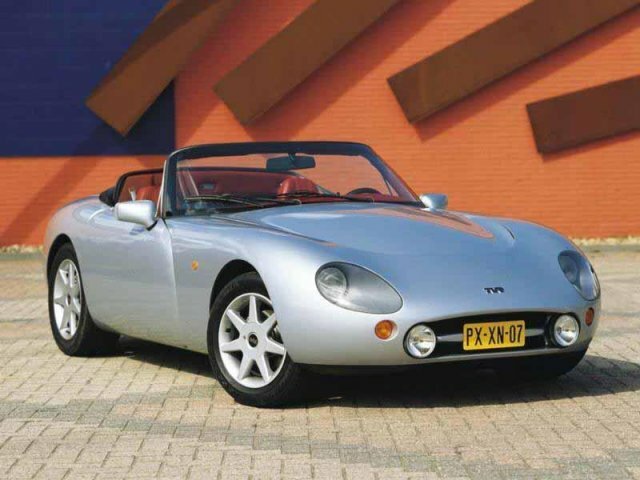 I also have to respect the developers for not succumbing completely to cultural bias and making the arguably best and most well-rounded car in the game a TVR homologation special instead of an over-tuned Skyline designed as a drag-strip special. There is also sufficient difference between the physics representations of the cars to make the different models more than just a series of cosmetically different skins for the same physics framework. 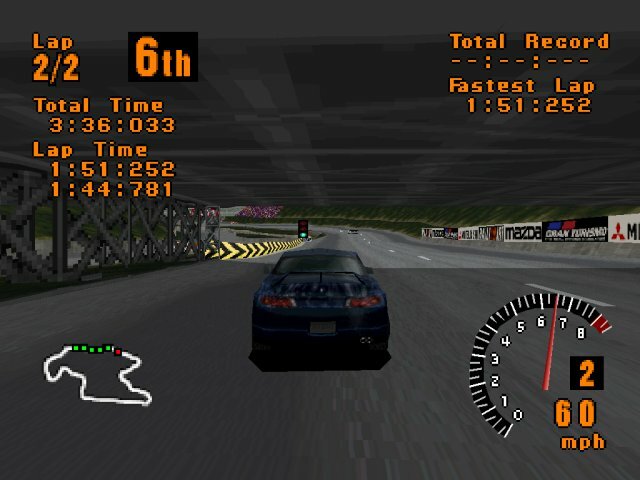 As befits a game which unironically described itself as a “driving simulator”, the physics and car modelling remain reasonably accurate, with simulation of shifting of the car’s weight as it passes through corners, proper oversteer and understeer, the ability to tune some of the Japanese cars to ridiculous lengths and so on, so forth, right up to the TVRs being terrifying, unrefined beasts which you have to grab by the scruff of the neck and pound into submission. A little like real life, then. Most of the cars that you can purchase are stock models of real road cars of the period around 1985 to 1997, but nearly all of these cars can be further modified using custom parts. These parts range from new turbochargers to a variety of tyres and from new clutches and transmissions to suspension systems. In turn, many of these sub-systems can be adjusted, including gear ratios, suspension travel and so on. Some of these systems create dilemmas, such as the choices between different turbocharger systems – will you put in that top-rated turbocharger and have to thrash it through all of the corners, or will you hold back, with less power when it comes to the straights? The game presents these options in terms which would not be unfamiliar to mechanics in real life, so real-world knowledge of automotive settings is helpful. While the original Gran Turismo did not present any of the real-world circuits found in later iterations of the series, it did have a decent collection of original circuit designs. With eleven circuits, ten of which are also present in reverse layouts, there is a nice balance between slower street circuits and more winding dedicated tracks. Each of them is well-designed, with sufficient variety to keep them from getting dull or painfully repetitive. The goal of the Gran Turismo mode is not only to win races, which earns money for new cars and improvements to existing cars in the player’s garage, but to win race series, the prizes for which include additional new cars. From the Sunday Cup, where your opponents are hatchbacks or small sports cars with leisurely performance to the GT World Cup, where only the homologation specials or the fastest of player-tuned cars can race with confidence, the different race series deal up different challenges and different rewards. Some of these races can be immensely challenging, including three-plus hour endurance races around the most difficult circuits in the game. To race in these series, however, the player must successfully complete licence tests. These tests both have the aim of teaching the player the skills they require to succeed and acting as a test of driving proficiency. While they serve well as an extended tutorial, they can be very frustrating, especially in the final licence, the International A licence. The licence tests are arguably far more difficult than those in later iterations in the series – I was only able to obtain the International A licence in about 2009, after several years of playing. The International A licence is made more difficult by the cars that are used in the tests; the Dodge Viper is the most powerful stock car in the game and has lairy handling to boot, while the TVR Griffith is a TVR, and therefore designed to eat small children. Looks great, goes like stink, but has an unfortunate habit of trying to kill its occupants. The frustration doesn’t only come from the difficulty of the licence tests, but from the way the game locks out a lot of the content until you complete them. Notably, you require the International A licence to do the GT World Cup along with all of the endurance races, a limitation which would not apply as heavily in later Gran Turismo games. That said, given the vintage of the game, Gran Turismo still has extraordinarily tight gameplay. The game is no longer a paragon of simulation physics, being supplanted not only by its own successors, but by ultra-realistic PC racing simulators which could focus more on being uncompromising to extremes by the virtue of their market niche and their userbase. Nevertheless, Gran Turismo makes you work for your victories. It doesn’t condescend to the player who only wants to thrash their cars around with no consideration of racing strategy. It’ll punish the person who thinks that high power is the be-all and end-all of automotive racing, the sort of person who doesn’t take proper regard for their suspension and transmission settings. This game is not for everybody. The simulation bent of the game isn’t going to appeal to all. The licence tests may prove to be a challenge too much for some players, while the in-depth tuning settings will alienate those that just want to sit down and race. The Quick Arcade mode goes some way in giving the casual player some degree of playability, but it is still largely subject to the same sort of realistic gameplay as the Gran Turismo mode. There are other flaws that exist as well, some of which are also present in later Gran Turismo games. The artificial intelligence is poor, sticking unswervingly to a racing line, even when you’re on that racing line. There is no attempt at making the AI look anything other than robotic, missing those little mistakes, daring or desperate overtaking manoeuvres or the occasional spinouts that would characterise a human driver. Due to licence agreements with the companies which produced the depicted cars, there is no damage modelling, meaning that a player is not heavily punished for some scenarios which would put them out of a race or have them disqualified in a real race. Given that contemporary PC racing simulators did have car damage, this is disappointing from the perspective of realism. Surprisingly, though, the graphics haven’t held up too badly. The low-polygon nature of the game is evident, but Gran Turismo was one of the most technically ambitious projects on the PlayStation and the ambition neither overstretched the technology nor the execution. Considering that the PlayStation only possessed 2 MB of main RAM and an additional 1 MB of video RAM, the graphics are fluid, consistent and are more serviceable than many other games of the era. The unlockable high-resolution mode makes this even more apparent, but is unfortunately limited to the night street circuits and time trial racing. A bit grainy, a bit blocky, yes, but it held up much better than the likes of Final Fantasy VII. The sounds haven’t held up quite as well, but are still serviceable. Compared to the visceral roars of engines in the contemporary PC Formula One simulation, Grand Prix Legends, the engine notes in Gran Turismo are really rather tame. However, they aren’t embarrassing and it would hardly be an easy task to go out and record every iteration of an engine note for every car in the game. The music very much places this game in the Nineties, with a mixture of alternative rock from Garbage, Ash and Feeder, along with a set of techno tracks from Cubanate. Gran Turismo has been overtaken in many ways by its successors and later racing simulators of other series. However, Gran Turismo presented something which was then unknown – a realistic presentation of racing on a console platform. Without the original, the Gran Turismo series would not continue to delight the series’ fervent fans today. The driving physics may be decidedly dated by modern standards, particularly by the standards of niche-market PC racing simulators, but Gran Turismo is still fun even after more than fifteen years since its release. Bottom Line: While the driving physics no longer conform to the idea of a racing simulator, Gran Turismo is still a fun game with a real challenge behind completing it. It’s held up surprisingly well considering its age, but lacks content versus most of its successors. Recommendation:Gran Turismo is still worth playing and with more than 10 million copies sold, it won’t be too hard to get a copy. Its primitive graphics and dated physics simulation will definitely put off some gamers, though and its appeal lies more in it still being fun rather than its accuracy or its level of content.